Dark Matter: Made of Sterile Neutrinos? What’s more elusive than a neutrino? Why a sterile neutrino, of course. In the Standard Model of particle physics there are 3 types of “regular” neutrinos. The ghost-like neutrinos are electrically neutral particles with 1/2 integer spins and very small masses. Neutrinos are produced in weak interactions, for example when a neutron decays to a proton and an electron. The 3 types are paired with the electron and its heavier cousins, and are known as electron neutrinos, muon neutrinos, and tau neutrinos (νe, νμ, ντ). A postulated extension to the Standard Model would allow a new type of neutrino, known as a sterile neutrino. “Sterile” refers to the fact that this hypothetical particle would not feel the standard weak interaction, but would couple to regular neutrino oscillations (neutrinos oscillate among the 3 types, and until this was realized there was consternation around the low number of solar neutrinos detected). Sterile neutrinos are more ghostly than regular neutrinos! The sterile neutrino would be a neutral particle, like other neutrino types, and would be a fermion, with spin 1/2. The number of types, and the respective masses, of sterile neutrinos (assuming they exist) is unknown. Since they are electrically neutral and do not feel the standard weak interaction they are very difficult to detect. But the fact that they are very hard to detect is just what makes them candidates for dark matter, since they still interact gravitationally due to their mass. What about regular neutrinos as the source of dark matter? The problem is that their masses are too low, less than 1/3 of an eV (electron-Volt) total for the three types. They are thus “too hot” (speeds and velocity dispersions too high, being relativistic) to explain the observed properties of galaxy formation and clumping into groups and clusters. The dark matter should be “cold” or non-relativistic, or at least no more than “warm”, to correctly reproduce the pattern of galaxy groups, filaments, and clusters we observe in our Universe. Constraints can be placed on the minimum mass for a sterile neutrino to be a good dark matter candidate. Observations of the cosmic microwave background and of hydrogen Lyman-alpha emission in quasar spectra have been used to set a lower bound of 2 keV for the sterile neutrino’s mass, if it is the predominant component of dark matter. A sterile neutrino with this mass or larger is expected to have a decay channel into a photon with half of the rest-mass energy and a regular (active) neutrino with half the energy. 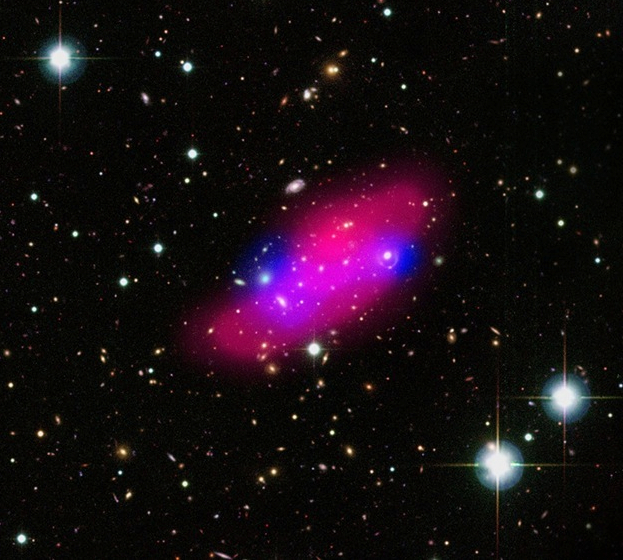 A recent suggestion is that an X-ray emission feature seen at 3.56 keV (kilo-electron Volts) from galaxy clusters is a result of the decay of sterile neutrinos into photons with that energy plus active (regular) neutrinos with similar energy. This X-ray emission line has been seen in a data set from the XMM-Newton satellite that stacks results from 73 clusters of galaxies together. The line was detected in 2 different instruments with around 4 or 5 standard deviations significance, so the existence of the line itself is on a rather strong footing. However, it is necessary to prove that the line is not from an atomic transition from argon or some other element. The researchers argue that an argon line should be much, much weaker than the feature that is detected. In addition, a second team of researchers, also using XMM-Newton data have claimed detection of lines at the same 3.56 keV energy in the Perseus cluster of galaxies as well as our neighbor, the Andromeda galaxy. There are no expected atomic transition lines at this energy, so the dark matter decay possibility has been suggested by both teams. An argon line around 3.62 KeV is a possible influence on the signal, but is expected to be very much weaker. Confirmation of these XMM-Newton results are required from other experiments in order to gain more confidence in the reality of the 3.56 keV feature, regardless of its cause, and to eliminate with certainty the possibility of an atomic transition origin. Analysis of stacked galaxy cluster data is currently underway for two other X-ray satellite missions, Chandra and Suzaku. In addition, the astrophysics community eagerly awaits the upcoming Astro-H mission, a Japanese X-ray astronomy satellite planned for launch in 2015. It should be able to not only confirm the 3.56 keV X-ray line (if indeed real), but also detect it within our own Milky Way galaxy. Thus the hypothesis is for dark matter composed primarily of sterile neutrinos of a little over 7.1 keV in mass (in E = mc^2 terms), and that the sterile neutrino has a decay channel to an X-ray photon and regular neutrino. Each decay product would have an energy of about 3.56 keV. Such a 7 keV sterile neutrino is plausible with respect to the known density of dark matter and various cosmological and particle physics constraints. If the dark matter is primarily due to this sterile neutrino, then it falls into the “warm” dark matter domain, intermediate between “cold” dark matter due to very heavy particles, or “hot” dark matter due to very light particles. the parameters necessary in these models to produce the full dark matter density fulfill previously determined requirements to successfully match the Milky Way galaxy’s total satellite abundance, the satellites’ radial distribution, and their mass density profile.. This entry was posted on Saturday, June 14th, 2014 at 10:42 pm	and tagged with Andromeda galaxy, clusters of galaxies, Dark matter, Milky Way satellites, neutrinos, Perseus cluster, sterile neutrinos, X-ray clusters, XMM-Newton and posted in Dark Matter. You can follow any responses to this entry through the RSS 2.0 feed.